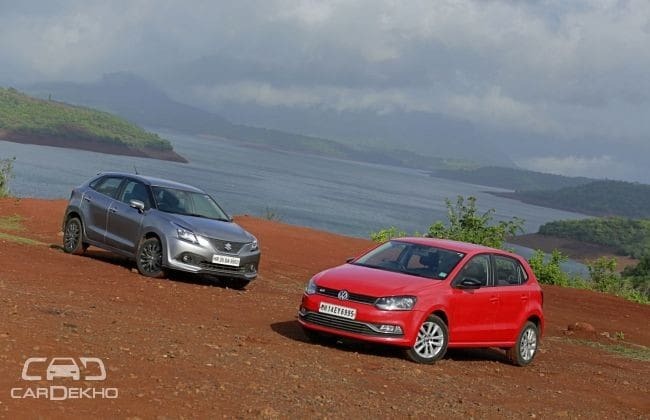 VW’s Polo GT TSI and Maruti Suzuki’s Baleno RS are cars that have more in common than their looks will let you believe. Although they follow different recipes, both hatches promise more excitement in their appeal and the way they drive. At the same time, they have been careful to not compromise on practicality. Which of the two makes a more compelling case for itself as a spirited but practical car for the daily grind if it were the main car in the household? And, why? To answer that, we spent a couple of days in and around Pune with these premium hatchbacks. If you have spent that extra bit for a sportier version, you want people to notice it. Both these hatches try and achieve exactly that with varying degrees of success. The RS is easier to differentiate from the regular Baleno. The Japanese took the top-spec Alpha trim of the Baleno and gave it sportier front and rear bumpers, black 16-inch alloy wheels, mesh front grille and a set of thin side skirts. To top it all off, the RS badge finds its place at the boot lid. The German car, on the other hand, has had a more subtle change in outlook. The GT TSI gets all the goodies from the Polo Highline and tops it off with GT badges on the front grille, C-pillars and the boot lid. Additionally, the ORVMs are finished in glossy black and there is small spoiler at the back. Like the Baleno, the GT TSI also gets 16-inch alloy wheels, which are slightly different in design than the 15-inchers you get in the standard car. However, unlike the Baleno, the GT TSI gets added flair on the inside as well. Both the pedals (accelerator and brake) are garnished with metallic tops and the interior gets an all-black treatment. As far as dimensions are concerned, these hatches are identical to their siblings. So, the Baleno is longer (24mm), wider (63mm) and taller (41mm) than the German hatchback. The Maruti also stands on a longer (by 51mm) wheelbase of 2,520mm, and has 5mm more ground clearance (170mm vs 165mm). The Volkswagen also weighs 159kgs more than the Suzuki. However, in terms of build quality it is the Volkswagen that has the upper edge. Every panel on the Polo feels rock solid and gives you a pleasing sense of robustness. The same can’t be said for the Baleno. Although the lighter panels help in shedding the overall weight , the Baleno also feels a bit flimsy in comparison. Like on the outside, their distinct styling philosophy continue on the inside as well. The Maruti Suzuki hatchback makes do with a funky layout of the dashboard, finished in black- and silver-coloured plastic panels. On the other hand, VW’s design recipe remains solid and handsome. The dashboard is all-black with some chrome inserts that subtly liven it up. Both cars borrow the instrument cluster, seats, steering wheel and the touchscreen infotainment unit from their respective standard variants. The front seats in both the cars are comfy but the Baleno’s could have done with more lateral support. At the rear, seats are well cushioned and offer good under-thigh support in both cars. However, the Baleno raises the practicality bar by offering more leg, knee and headroom than the Polo. It is the obvious choice for anyone who wants to ferry around three average-sized adults on the rear seats. Even in the boot space department, the RS outshines the GT TSI with 59 litres more (339 litres vs 280 litres). Where the Volkswagen does manage to outclass its Japanese counterpart is the build quality. Everything from the rock-solid thump of the door closing, the dashboard, the door panels and the center console feels properly built and fit. The Baleno, on the other hand, isn’t as reassuring. The fit and finish is quite good but there is some room for improvement, particularly on the plastics used to design the center console. On the whole, cabins in both these cars are welcoming and well laid out. While the Baleno has a roomier cabin, bigger boot and a bit more exuberance in the styling department, the VW’s sturdy built quality is commendable. Both these cars cost around the same as a mid-size sedan. You’d expect them to come loaded with creature comforts. And they do! Even in its RS form, the Baleno borrows all the gadgetry from its Alpha trim. On the outside, everything from automatic headlamps with projector lenses, LED DRLs, LED inserts in the taillights and a rearview camera are on the list. The VW gets none of those things. What it does get over the Baleno is rain-sensing wipers. The VW does try to fight harder inside the cabin, with features like cruise control (which is tricky to set up), one-touch operation for all four power windows, auto-dimming IRVM and a 5.0-inch touchscreen infotainment unit with MirrorLink support. While the Baleno misses out on cruise control and one-touch operation for all windows, it trumps the GT TSI with a bigger 7.0-inch touchscreen display with Android Auto and Apple CarPlay compatibility and a push-button start/stop functionality. The Baleno adds a dash of practicality with a 60:40 split for the rear seats and a front armrest, which the VW really needs. Both cars come with dual airbags, ABS with EBD and ISOFIX anchorages for a child booster seat. Both cars get their juices from a turbocharged petrol motor. The Maruti Suzuki Baleno RS is powered by a 1.0-litre, 3-cylinder BoosterJet engine that produces 102PS/150Nm and sends power to the front wheels via a 5-speed, silky smooth manual transmission. The Volkswagen Polo GT TSI has more cubic capacity and an extra cylinder to play with and therefore it is a bit more powerful. The 1.2-litre, 4-cylinder TSI engine churns out 105PS/175Nm. That’s not all as the Polo also packs a sophisticated 7-speed dual-clutch automatic gearbox. With the combination of a light clutch, direct steering and smooth gearshifts, albeit with slightly stretched throws, the Baleno isn’t strenuous to be in. In start/stop traffic conditions, the Maruti is easy to drive and thanks to a wide power band, the car doesn’t ask for gear changes too often. The GT TSI has its own way of pleasing you. The convenience of a quick and smooth automatic gearbox pays dividend in stop/start traffic conditions. The steering is on the heavier side but, unlike the Baleno’s, delivers good amount of feedback. It is the ride quality where the Baleno shines through. Compared to the standard car, the springs on the RS have been toughened up to accommodate the extra 60kg of weight. That said, it still is way comfier and forgiving than the German car. The suspension on the GT TSI is on the harder side and works against the pluses of the car at least on our punishing city roads. In third gear, the Baleno RS completed the 30-80kmph sprint in 7.08 seconds while the Volkwagen, which is powered by a slick downshift from its dual-cutch gearbox took just 5.92 seconds to accelerate from 20-80kmph. It’s hard to compare an automatic to a manual in this aspect on the numbers since an automatic does shift down a gear for roll ons but we can tell you that both motors offer prompt responses in city conditions. When tested for 0-100kmph acceleration the Baleno came out top at 10.52 seconds, just 0.09 seconds quicker than the GT TSI. The VW’s seven-speed gearbox lets it cruise in a more relaxed fashion. Get on the highway and you understand why VW has arrived at the stiffer suspension setup for the GT TSI. At high speeds and in fast corners, the car feels planted and gives you the confidence to push harder. As far as the Baleno is concerned, the softer springs deliver a lot of up-and-down movement even over small bumps and a noticeable amount of body roll. Also, the brakes on the Baleno bite abruptly and takes some getting used to. Thanks to the Baleno’s super-eager disc brakes in all corners and lesser kerb weight, it outclassed its German competitor by stopping quicker while covering a shorter distance. It also wins in the the fuel-efficiency test as well. In city and on the highway, the Baleno RS returned 15.35kmpl and 20.80kmpl respectively. The figures for the VW were less promising, with 11.38kmpl in the city and 16.66kmpl on the highway. Ideally, what we really crave is for a cross breed between the two. One that delivers the convenience of an automatic, is built well, has a practical cabin and comes with a feature list to complement its high price but neither of these cars tick all the boxes. The GT TSI has the advantage of an easy going automatic for city traffic but it isn't as good as the RS when it comes to ride comfort. It’s a cracking prospect for someone for whom the focus is about spending time behind the wheel to cover long distances on a daily basis. The Baleno RS though offers a better package as a family car that also has peppy performance. Sure, it misses out on the convenience of an automatic, lacks the driving engagement to excite enthusiasts and we wish it was built better. On every other front though, the Baleno doesn’t really falter. It has a comfortable ride, the engine offers great drivability for city use, has the more usable backseat, packs more creature comforts, is backed up by Maruti Suzuki’s rock-solid service network, and will hold on to its value in the used car market much better.